It has been report of a major fire that is currently burning near Port-au-Prince harbor. The damage so far has been considerable. According to several radio stations in the Haitian capital, several cars have already been consumed by the fire, including merchandises. The report also indicated that there are lost of lives due to the fire; however, they are unable to count the number of fatalities. Why are there so many unnecessary deaths during a fire? Another reason is lack of automatic sprinkler. Can you imagine for a moment you just wake-up and faced with an out of control fire? 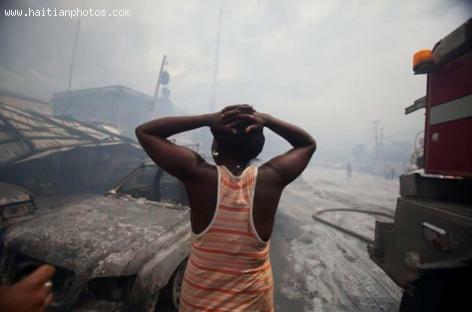 Many people in Haiti receive burns or get kill in a fire not because they were unable to scape the fire. They become victim usually because of greed. Some people try to save their belonging or see the fire as an opportunity to get materials. These people need to realize that wHen a fire occurs, there is little time to escape. A fire can spread by doubling its size in seconds. Ti Machan yo Selman ki pedi ak Dife Sa. Presidan ak Premie Minis ap Vini visite e yap promet yo Tout bagay, E Pi Se Tou. Apre Ou Pape Tande Pesonn Anko. Se pa premye Dife ki boule mache an Ayiti. It is not the Iron Market or Market Hyppolite. The fire took place at the Maritime and Navigation Service in the Marche du Port. It was also reported just as it is stated here that 3 people had died and were injured as a result of the fire. And as usually, Haitian firefighters were the last to arrive. We will continue to pay a huge price for our inability to plan and manage our lives. I heard that the fire somehow was ignited through a combustible combination of Clorox and fertilizer. How come people in Haiti do not believe in fire prevention? Can you imagine all these people doing business in one place and there is no provision in case there is a fire.